Join us for an artist talk and reception for Trail & Tribe, the newest exhibit at MilkBoy ArtHouse, featuring work by Korey Richardson. 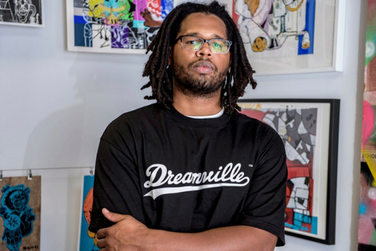 Korey Richardson is a painter and printmaker, creating work that includes themes related to history, popular culture and identity. His structures, compositions and figures are inspired by the traditional expression and connection to the study of the African Diaspora and is also stylistically inspired by street art. He has exhibited work throughout the Washington metro area and his work is included in public collection of The David C. Driskell Art Center for the Study of the Visual Arts and Culture of African Americans and the African Diaspora at the University of Maryland. He received a BA in painting and printmaking from the University of Maryland College Park and currently lives and works in Maryland.